In 2015-16 a needs assessment for Cranbrook was undertaken. This exercise was designed to establish the population structure and characteristics of the town, the emerging health and care needs and to predict future population growth and health and care needs. A Health Impact Assessment was produced in 2006 before development began, which assumed a community with similar characteristics to Exeter or wards within the city with slightly above average levels of social deprivation, such as Whipton, and this has proved to be broadly accurate to date. In mid-2015 there were around 1,070 occupied dwellings in Cranbrook with an estimated population of 2,500. 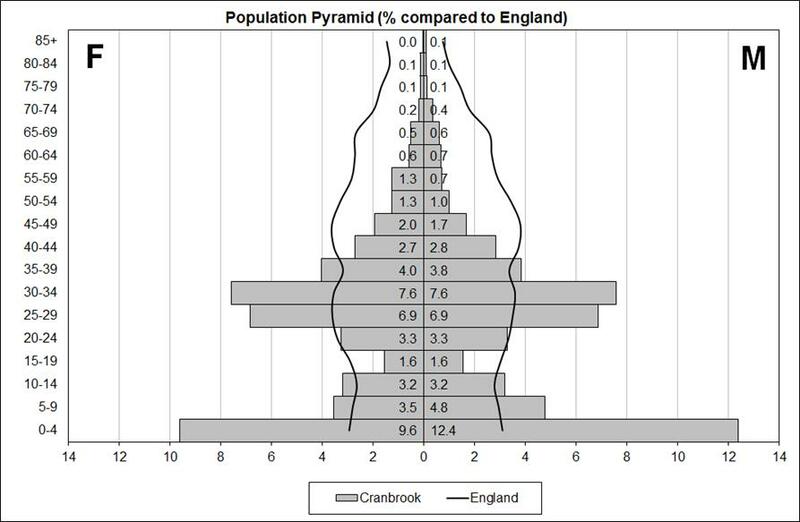 The population structure, as illustrated in the population pyramid below is very young, with a high proportion of adults in the 25 to 34 year old age group, and a very high proportion of children under the age of four. The proportion of children aged between five and 14 is also above the national average and is likely to grow as the primary and secondary schools develop and expand. Only a small proportion are aged 45 and over, with very few above retirement age. This structure is unlike any other community in Devon, including new developments, which whilst younger tend to be less extreme in profile. It does have strong similarities to the town of Cambourne in Cambridgeshire, a town seven miles outside of Cambridge which was initially developed in the 2000s and is around 12 years ahead of Cranbrook in relation to the phasing of development. 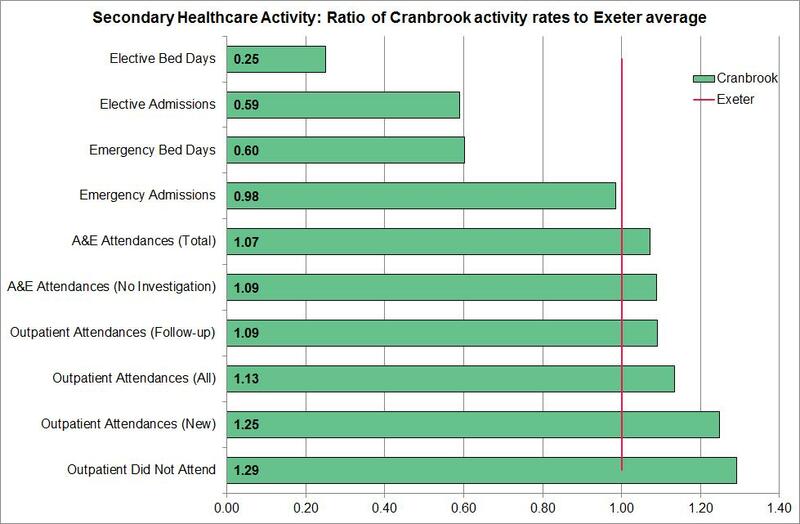 The Cranbrook population is largely drawn from Devon, with around half coming from Exeter, a quarter from East Devon, with only around 5-10% of residents previously residing outside of Devon. The current housing tenure of Cranbrook is 60% private, 20% social rented, 10% shared ownership and 10% ‘low cost’ rented. This is a relatively high proportion of affordable housing, most similar to the Mincinglake area of Exeter. 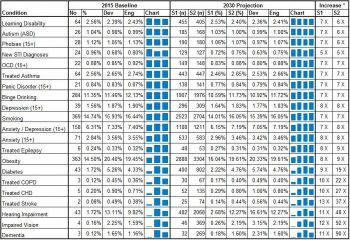 As the community develops and expands the future tenure mix is likely to resemble Crediton or Cullompton. Jobseekers Allowance rates are consistent with the East Devon average, and benefit claimant levels are relatively low. Car ownership is very high, with the majority travelling to work by car, with Exeter as the main destination for work. Most residents consider it a good place to live with relatively low crime rates and no major environmental health concerns. Whilst deprivation indices are unlikely to be available for the town for some time, initial research suggests levels of socio-economic deprivation marginally above the Exeter and national averages, which is consistent with the tenure mix, population structure and urban nature of the community. 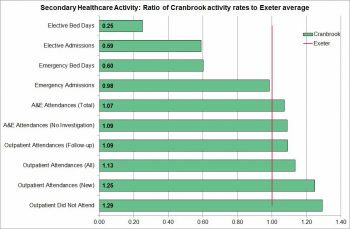 The pattern of health and care needs in Cranbrook is strongly influenced by the age profile of the area. Very low levels of long-term conditions and use of community-based social services are seen. Relatively high levels of smoking prevalence are seen in the area. 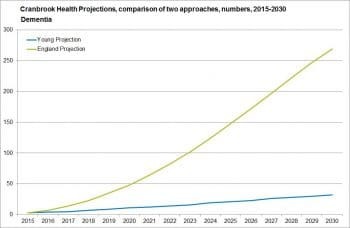 The general health and care needs of the population relate to this age profile, with a focus on mental health and wellbeing, health-related behaviours, such as smoking, and sexual health, with considerable scope for interventions targeted on the primary prevention of disease and injury. This is evidenced by an age standardised analysis of secondary health care activity rate highlights relatively high levels of ‘front door’ activity, such as outpatient and A&E attendance, but relatively low levels of higher intensity admitted patient care, particularly in relation to planned (elective) and low levels of bed days. 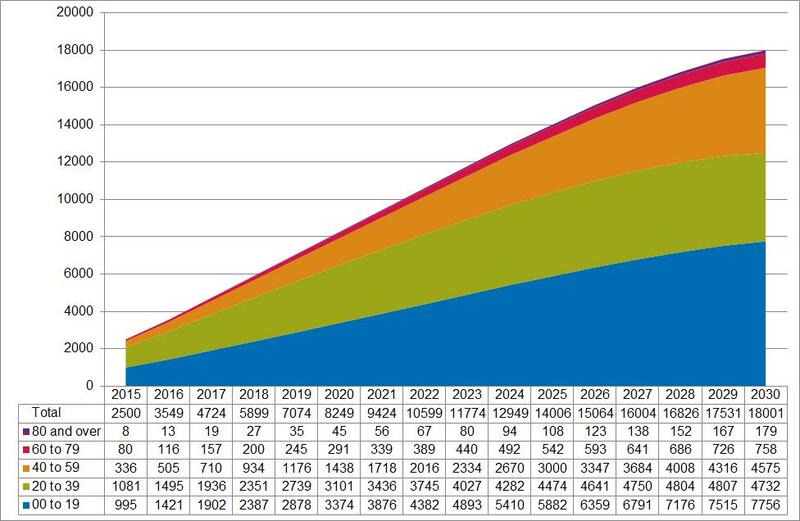 Population projections were created based on the current population structure of Cranbrook and planned housing developments between 2015 and 2030. 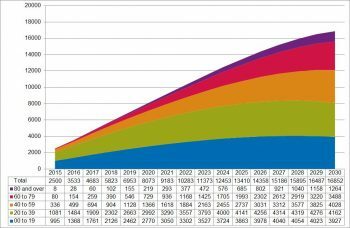 Two alternative models of population growth were created. The first is the predicted growth based on only slight population ageing, and is based on the pattern of population change seen in Cambourne in Cambridgeshire. This would suggest a 2030 population of around 18,000 of which 70% would be under the age of 40. The second model is based on movement to the England population profile over the 15 year period, and predicts a smaller 2030 population of less than 17,000 of which 48% would be under the age of 40. The first model is the most likely scenario, with the ‘England profile’ projection unlikely, even with considerable intervention. The future age structure of Cranbrook will be a major influence on the health, care and service needs of the population. 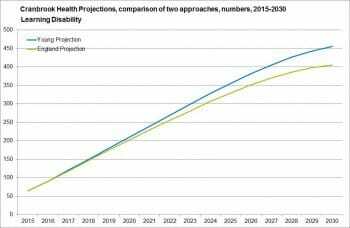 However, the substantial population increase seen under both scenarios will mean that all conditions will increase substantially over the next 15 years. 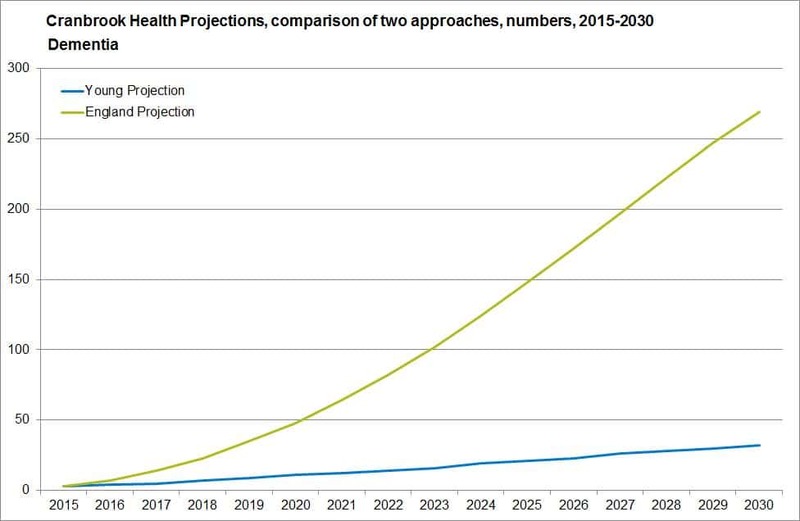 The table below sets out the numbers and percentage of the population with selected health conditions and health-related behaviours, both at present (2015), and in 2030. 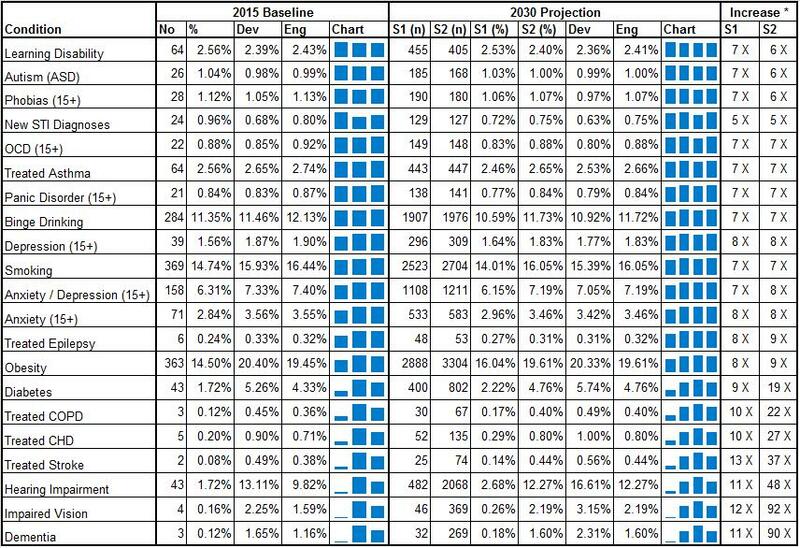 The table is ordered so the biggest differences between the two scenarios appear at the bottom. This highlights that under the more likely ‘young profile’ scenario (S1) the focus of health and care needs will relate to mental health, sexual health, health-related behaviours and conditions affecting younger people or affecting people uniformly across the life course such as learning disabilities, autistic spectrum disorders, asthma and epilepsy. Under the less likely ‘England profile’ scenario (S2) health needs would be more focused on long-term conditions such as diabetes, COPD, CHD, stroke, along with hearing and vision impairments and dementia. Under this scenario extreme differences for these conditions appear between the likely younger population scenario and the England profile scenario, highlighting that any intervention to balance the population to the England profile would require a much greater focus on care and treatment rather than prevention services. Source: Cranbrook population projections 2015 to 2030, produced by Devon Public Health Intelligence Team, 2015 applied to estimated prevalence rates by age from Dementia UK, Adult Psychiatric Morbidity Survey, Integrated Household Survey, Health Survey for England, GUMCAD, Symphony, POPPI, and PANSI. 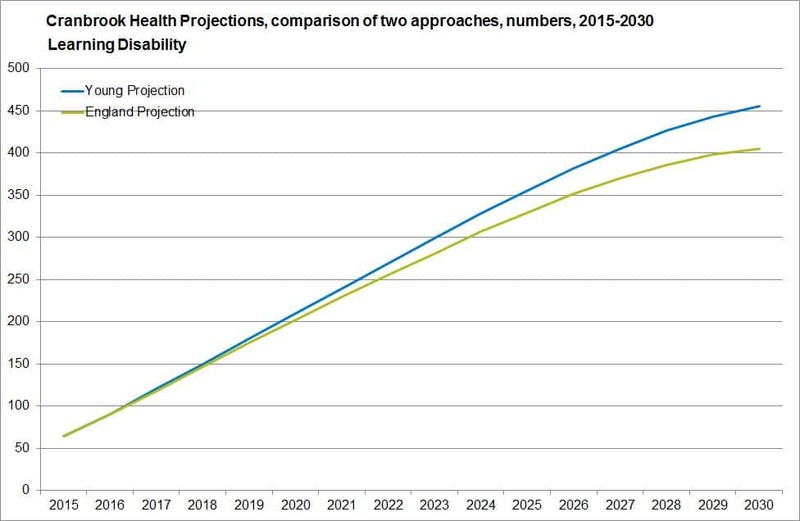 S1 is scenario 1 (young population) and S2 is scenario 2 (national profile). * The increase column is a multiplier i.e. 7 X (7 times higher).